My kitchen is always filled with the wonderful aroma of oranges whenever I make this carrot and orange soup. The natural sweetness of carrot goes beautifully with oranges. 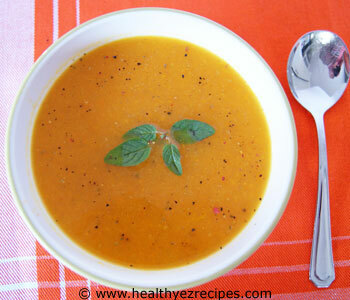 The carrots give the soup a wonderful bright orange color, while the oranges add the zing. So not only does this soup look fantastic, but it tastes amazing as well. Chop the onions and carrots. As the vegetables are going to be pureed they don’t have to be cut into bite-sized pieces. The carrots should be cut small enough so that they cook through. Whether you peel the carrots first is up to you. If using young, fresh carrots it’s probably not necessary. Grate the zest of one of the oranges. Reserve both oranges for later as you will need the juice. Melt the margarine in a large saucepan. 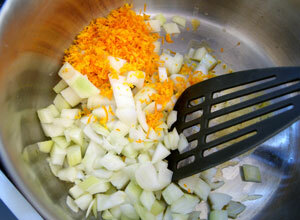 Cook the garlic, onions and grated orange zest in the butter for a few minutes until the onion softens. 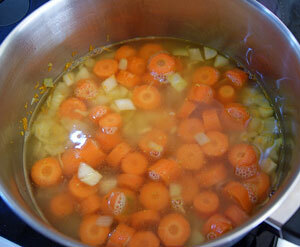 Add the carrots and stock and bring to the boil. 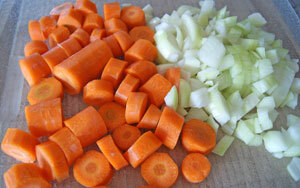 Cover the pot, lower the heat and simmer for 15 minutes or until the carrots are cooked. Remove from the heat and leave to cool slightly. 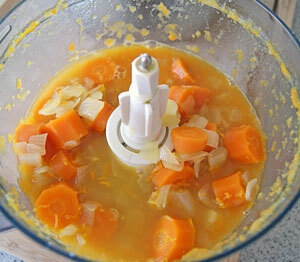 Spoon the soup into a food processor and puree until smooth. It’s probably best to do this in several batches. Juice both the oranges and add the orange juice and blend again. Return the soup to the saucepan and reheat but do not boil. Season with salt and freshly ground pepper.